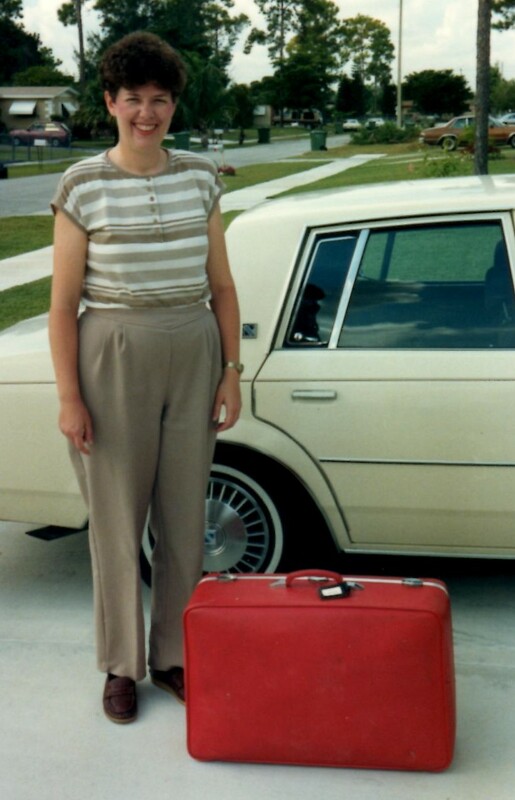 Since many of you are traveling this summer, I will repost over the next few weeks my international travel tips that I have learned over the years. Happy Travels! “Jesus came and spake unto them,…..Lo, I am with you always, even unto the end of the age” (Matthew 28:20 KJV). I just arrived in Honduras to join my first medical mission trip. We changed planes in Miami, but my suitcase didn’t make the transfer, so all I have is my carry on bag. I put in an extra pair of underwear and an extra blouse, my Bible, and little else. Dr. Paul, our medical director, led our group in devotions this morning before we boarded the old school bus to travel over muddy dirt roads seventy miles through the mountains to the villages where we will hold free clinics. We all sang joyfully, “This is the day that the Lord has made!” He read Matthew 28:20 and encouraged us to remember Jesus was with us, to be flexible, and to smile! He led us in prayer, committing the day to the Lord. We bumped along about five miles per hour while chatting with one another. I realized how much I take for granted smooth paved roads in the USA. At the top of the mountain, our bus leaned to one side and stopped in a foot of mud. Everybody got out to help push it out, but the quicksand-like mud sucked my loafers (should have worn tied shoes) right off my feet. I dove down in the mud and pulled them out. I climbed back on the bus in my stocking feet, totally covered in mud. 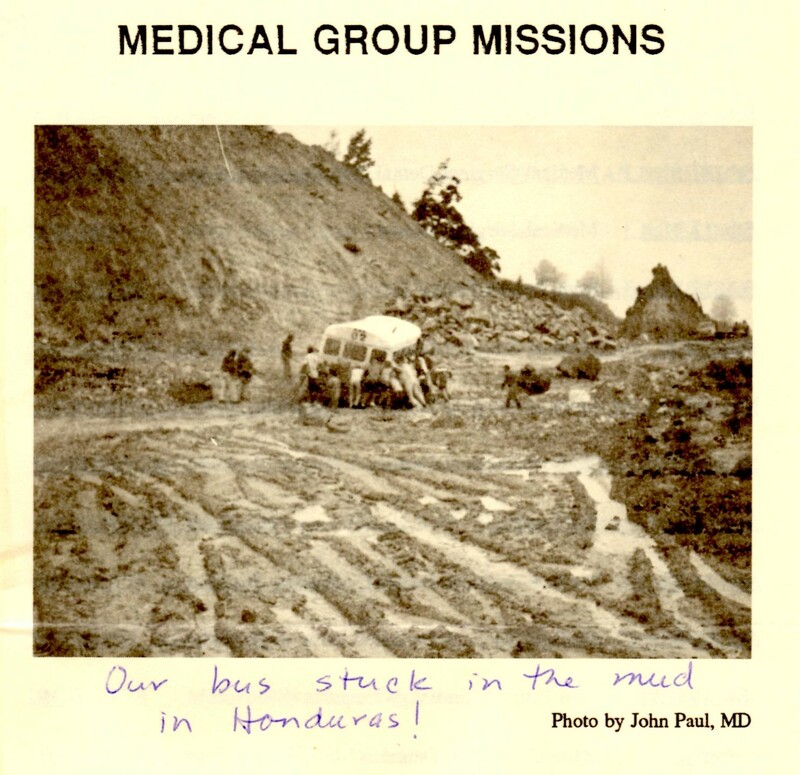 Honduras bus stuck in the mud. Everyone helped push it out. Upon arrival at a boarding school, I took a cold shower and shivered from the fifty-degree air temperature. One of the dentists gave me a toothbrush, and a generous fellow nurse loaned me a pair of scrubs, clean socks, and earplugs. She brought a whole bag of foam earplugs for us newbies. I quickly discovered the dogs barked until two A.M.. and the roosters started crowing at five A.M. 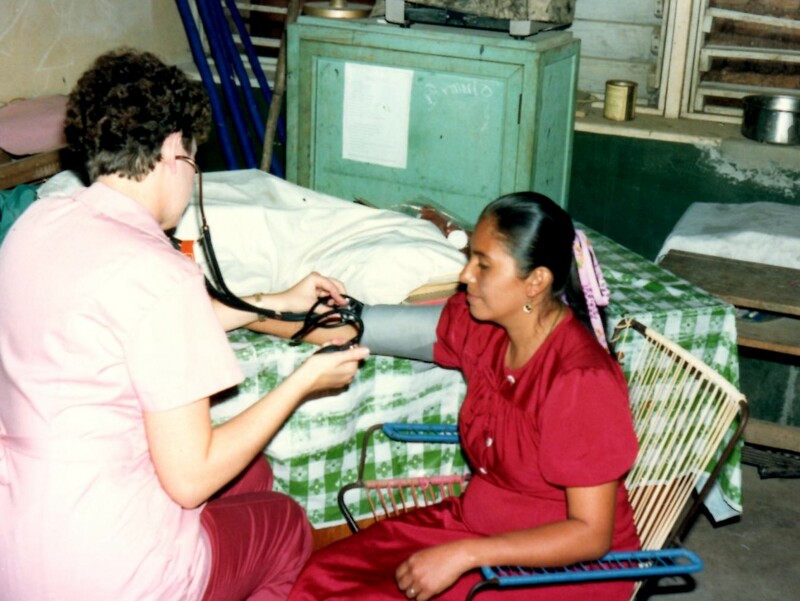 I checked each patient’s blood pressure and shared the gospel with them. I traveled the next day in a small pickup truck with a cheerful man who hauled the luggage to the clinic site. We pantomimed since I only knew a few words of Spanish and he knew no English. Smiles and laughter helped! Only one doctor and I arrived at the clinic. We didn’t know where the rest of the team was, traveling in a cattle truck. I began checking blood pressures and triaging the throngs of patient waiting for us at the village school. This continued to be my assignment the rest of the week. I shared John 3:16 in Spanish with each patient and gave them a gospel of John while the village pastor shared the gospel with the crowds while they waited. I borrowed scrubs to wear all week and the village ladies washed them by hand for me and hung them up to dry. Friday, I looked up the dirt road and could not believe my eyes. Our mission director walked down the road with my red suitcase! I never thought I would see that suitcase again. I survived an entire week without it. How wonderfully God provided for me through the brethren. I realized how little I needed to survive. “But my God shall supply all your need according to His riches in glory by Christ Jesus” (Philippians 4:19 KJV). But for my next international trip, I packed my carry on bag with extra clothes, medicine, food, toiletries, and sturdy tied shoes. Then I relaxed, knowing I would be fine if the airlines lost my suitcase again. Awesome memories, and yes! He provides us with all we truly need!